Pro Leagues Embrace A Big-Payout Evolution In Fantasy Sports If you watch football this weekend, you'll see lots of ads for daily fantasy sports websites. They let fans bet real money on the performance of players, but aren't considered gambling operations. 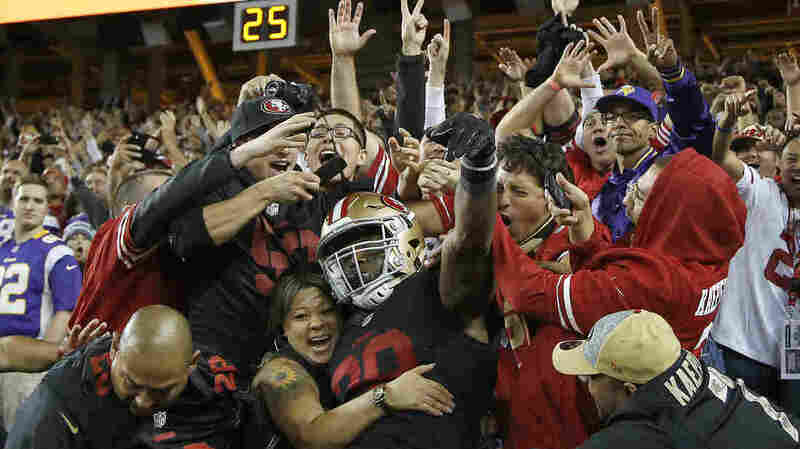 San Francisco 49ers fans celebrate a touchdown with running back Carlos Hyde on Monday in Santa Clara, Calif.
"On FanDuel I've won over $62,000 — try FanDuel today." "This is DraftKings. Welcome to the big time. You can play when you want with the team you want. Just pick your contest, pick your team, and pick up your winnings." These types of ads have been inescapable on NFL broadcasts so far this season. They are encouraging fans to play a type of fantasy sports game — and bet real money on their performance. DraftKings and FanDuel each say they've raised hundreds of millions of dollars from investors and paid out millions in prize money to winners. That success has become apparent in the sheer saturation of ads on sports broadcasts, podcasts, websites and more. The business has become so big that some professional sports leagues are getting a piece of the action. 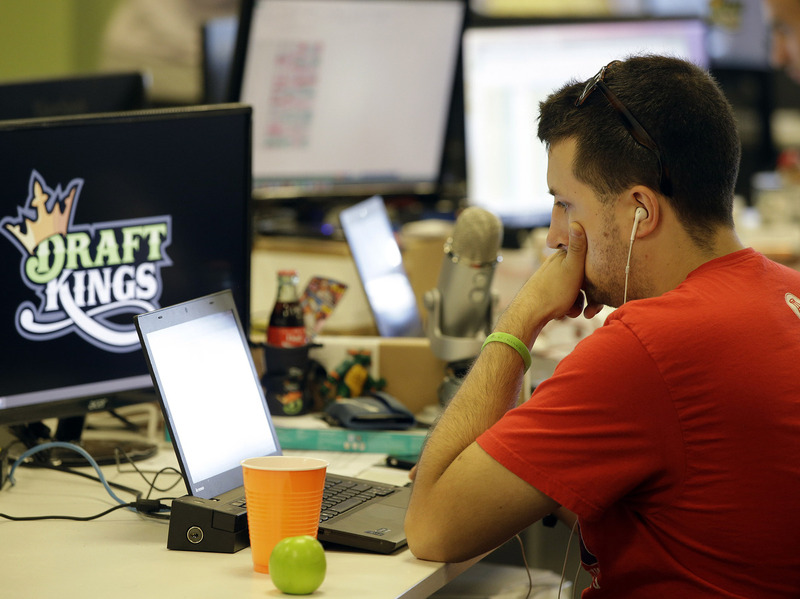 Devlin D'Zmura, a trending news manager at DraftKings, works on his laptop Sept. 9 at the company's offices in Boston. The websites want to change the way that fantasy sports traditionally have been played. About 50 million people in North America play fantasy sports games each year, but until recently they've been low-level competitions among friends, neighbors and co-workers, often for little more than bragging rights. Typically the games start with the pool of players in a professional league — the NFL or Major League Baseball, for instance — who are then drafted onto fantasy teams by a dozen or so fans playing against one another. If your team's pro players — who typically play for many different teams in real life — do well in their games, then based on their stats, you do well in your fantasy game. These sorts of games were played for decades using pens, paper and newspaper box scores, but the Internet made them much easier to organize and run, so most major sports sites got involved. What companies like FanDuel and DraftKings have done is broken down what usually have been season-long competitions into many single-day contests — while pulling a lot more money into the games. DraftKings, for instance, runs a contest every week with a $20 entry fee and a grand prize of $2 million. "It's just one of those things that, once you do it, and you're already into fantasy sports, you will get hooked immediately," says John Reidy, a sports fan from Denver. "Because you get to pick something new every week — and I know that's what the commercials say, but it's really true." For Monday Night Football, when the Minnesota Vikings played the San Francisco 49ers, Reidy had money on the line. But he wouldn't win or lose based on which team won, or by how the teams performed against the point spread. Instead, it was about how players Reidy had drafted — including longtime Vikings running back Adrian Peterson, "which I'm not thrilled about, don't really like him as a person, but he's a great fantasy asset," he says — would perform versus the teams others in the competition had drafted. Reidy was up a few points going into Monday's game, but the next-best team had 49ers running back Carlos Hyde, and could catch up if Hyde had a better game than Peterson. Former league MVP Peterson ran for just 31 yards, while Hyde, making his first NFL start, got 168 yards and scored two touchdowns. "Very frustrating," Reidy says. "But the beauty of it is that I can try again next week." That's the way these companies market themselves — instant cash, instant gratification, and a clean slate as soon as the day's or week's games are over. It's been near-instant gratification for the companies involved too, says John Ourand with Sports Business Daily: DraftKings and FanDuel didn't even exist five years ago but so far this year have spent $500 million on TV ads. Much of that money came from big-name investors. "If you take a look at the list of investors in let's just say FanDuel, you have the NBA, Google Capital, you have Time-Warner, Turner Sports, NBC Sports, Comcast," Ourand says. "DraftKings, if you take a look at the sponsorship deals that they've signed with individual teams, it's Cowboys, Broncos, Patriots. And their investors are another who's who — MLB, the NHL ... Major League Soccer. ... You have big, blue-chip media companies and sports leagues that are investing in these two companies because they see a lot of potential in daily fantasy." The windfalls from professional sports leagues and teams may seem unusual, given their long-standing opposition to legalized gambling. But the leagues know that fantasy players are more engaged than the average fan — and more willing to watch a game they otherwise might not care about, which means higher TV ratings. And while players on FanDuel, DraftKings and other sites put up money for a chance to win a lot more, it's not considered betting — thanks to an exemption in a 2006 law regulating online gambling. 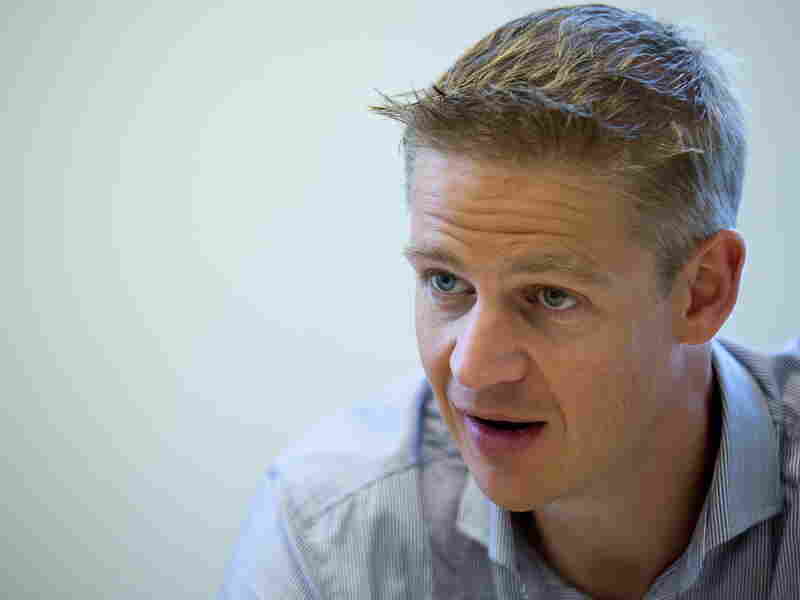 Nigel Eccles, CEO and co-founder of FanDuel, says it's a game of skill not chance. "When Congress sat down to decide what was legal and illegal, they clearly made a distinction that fantasy sports was legal," he says. Of course, back in 2006, fantasy sports were mostly just small-time games among friends. Today, they've become a gigantic, still-growing industry — with a lot of money on the line.